A septic system dye test is a common test performed by home inspectors and some septic companies as part of their septic system inspections. But don’t let it fool you! Although a dye test sounds good, it is very limited on what it will tell you about the septic system. What is a septic dye test? A dye test is what we would equate to a visual inspection: water is introduced to the system to check for seepage over the yard. As the name suggests, the inspector dyes the water so that it is easily visible if it comes to the surface. Should you use a septic dye test? 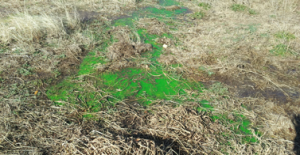 The chances of finding a problem with a septic system by performing dye test (or visual inspection) is unlikely unless you already see water seeping out of the ground; it’s for this reason we generally do not recommend dye tests or visual inspections. However, adding dye to a system to verify an already-suspected problem can be helpful. Let’s use an example of a septic system that’s located in a low area where rainwater runoff accumulates. If the area over or around the drainfield has standing water, adding dye could verify if that water is from the rain or the septic system. Or, if it is uncertain if some facilities in the home are connected to the system (if bathrooms were added to the house, etc. ), we occasionally insert different colors of dye down each facility to see if they enter the tank. If you really want to know the workability of your septic system, a full inspection should be performed. This is the only type of inspection in which the lids are opened and the tank pumped, making it more likely to catch potential problems than a visual inspection. Need to schedule a septic tank inspection? Please call us at 210.698.2000 (San Antonio) or 830.249.4000 (Boerne) or contact us online to schedule an appointment. ← Can My Home Inspector Perform My Septic Inspection?